Thursday afternoon saw me out on the water from Cattle Point heading for Discovery Island to shoot some photos of the light house. I struck out for the southwest corner of the island. The plan was to let the flood tide and SW winds push me along. I crossed north of Tod Rock, passed Fiddle and Carolina Reef and across Plumper Passage. Just south of Commodore Point there was a nice one foot rip about two meters off shore. After playing in the rip I turned back for the south shore of Discovery and found a nice quiet inlet to switch my paddles. I put the carbon fibre blade away and pulled out the equally nice but more durable fibreglass. For the next part of the trip it would be me, the waves, and the barnacles as I cruised through the rock gardens. This is a challenging place to play in the rocks. I think it's best half way between the high tide and low tide marks. If it's too high, it's too easy, too low and it's impossible. Wind and swell add to the degree of difficulty. If you're afraid of scratching your boat stay away. For some reason the barnacles here seem bigger, more jagged and sharper then anywhere else in the area. This is not the place to make mistakes. Such as the two I made. Picture to the right is a beautiful cowboy camping spot. It's outside of the Provincial Camp ground on the Indian Reserve. Camping here is illegal unless you have permission of the local band. 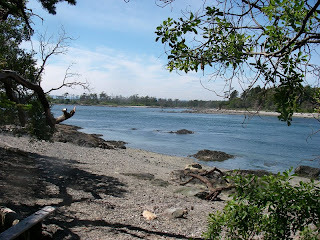 The legal camp ground faces south and has a commanding view of Juan de Fuca Strait and the Olympic peninsula. The Lighthouse has been automated. This would be a great site for a kayaking school. Throughout the summer it beginners could be taught the fundamentals . In the winter the school could focus on advanced skills as students learned to grapple with the seasonal storms.